Nainital is picture perfect: lying in a lush green valley in India's 'Lake District', the town sits on a crescent-shaped lake, surrounded by the snow-capped peaks of the Himalayas. Its picturesque location makes it a hugely popular destination for domestic and foreign visitors: each year, Nainital's population increases fivefold due to the influx of tourists, placing huge strains on the town's resources, including the water supply. It's not just tourists that are contributing to the strain, however. For years, Nainital has been plagued by illegal construction, which has been affecting its ability to supply water. The main lake in Nainital is connected to a smaller lake via an underground channel, and together they supply most of the town's water. The smaller lake remains dry for just over half the year, but when it fills again during the monsoon, it becomes an important reserve reservoir for the main lake. But despite a ruling from the Indian government banning development in the dry lake bed and the surrounding area, illegal construction has been relentless, to the point where the smaller lake can no longer store enough water to supply the main lake, and water levels in Nainital are under severe pressure. "Not being able to supply water is a major liability for any government or local authority," says Dr Bhaskar Vira of Cambridge's Department of Geography. "What we've been doing is looking at the underpinning science, seeing what the political and social issues might be, and then working with the relevant people who can intervene and make a difference." Vira is leading a major research project that is examining the ways in which small towns in hill and mountain regions of South Asia depend on springs, streams and rivers for their supply of water. Vira and his colleagues from the Southasia Institute of Advanced Studies in Nepal and the Centre for Ecology Development and Research (CEDAR) in India are looking at six towns – four in India (including Nainital) and two in Nepal – to understand how they are coping with the ever-increasing demand for water. The project is part of the Ecosystem Services for Poverty Alleviation programme, which is funded by the Natural Environment Research Council, the Economic and Social Research Council and the UK's Department for International Development. India is a wet country, but almost all of the rain falls in about two and a half months during the annual monsoon. The problem in India is how to safely store and transport water so that it's available 12 months a year, and distributed evenly throughout the country. Small towns – those with populations below 100,000 – in the hill regions of India and Nepal have grown rapidly, with very little planning for infrastructure needs, more generally, and water supply, in particular. Across the region, almost half of the urban population in the Indian states of Himachal Pradesh and Uttarakhand, and in the hill regions of Nepal, live in small towns. "Many of these towns are looking at what you'd call nature-based solutions – they don't have the budget to pump water in from 200 miles away," says Vira, who is working with Dr Eszter Kovacs on the project. "So they're much more dependent on the water that's available in their immediate vicinity, and they're looking at ways they can harness the resources they do have." One of the approaches that the researchers are taking is to identify and protect what they call 'critical water zones' – places where the springs that ultimately supply many of these towns are recharged. For example, one of the towns (Rajgarh, in Himachal Pradesh) which the researchers are studying has its water source in the Churdhar Wildlife Sanctuary, which not only protects the wildlife, but also protects the water supply, as the trees absorb the water so it doesn't run off. The ultimate benefit is a dual one, since the landscape is protected, but so is the water supply for the town. "Water is a precious resource, and it's very rare to find a water source in India that has no other existing users," says Vira. "So there are always going to be trade-offs; there are always going to be winners and losers when it comes to water in India." In Rajgarh, water that is being piped from 14 km away to the town is bypassing villages along the way, raising concerns about the water needs of the surrounding rural communities. In Mussoorie, another popular Uttarakhand tourist town, the team is looking at the dhobi (washing) community, which for about 100 years has washed all of the laundry generated by the local hotels, schools and passing tourists by hand in the local stream. Today, the work of the dhobi is supplemented by washing machines and driers, but much of the washing is still done in the stream, and many people still rely on it for their livelihoods. About 15 years ago, town authorities needed to increase their water capacity and approached the dhobi community to 'share' their water with the town, through the laying of new pipes and construction of a pumping station. Unsurprisingly, they were resistant to the idea. "Eventually, a compromise was reached so that some of the water was left behind for the dhobi to continue washing, but is it working? Was it a fair trade-off, for the town or the dhobi? These are the kinds of issues we're looking at," says Vira, who is Director of the University of Cambridge Conservation Research Institute. Back in Nainital, the researchers supported local activists who brought a case to the Uttarakhand high court to remove the illegal buildings. The Cambridge–CEDAR team also convened expert geologists and hydrologists who made recommendations about how the lake's water-storing capacity could be restored, which in turn supported the legal case. "Additionally, through our awareness campaign, we were able to galvanise the local population so they could see the risk that this illegal construction is posing to the community," says Dr Vishal Singh from CEDAR, one of Vira's collaborators, who recently spent two months in Cambridge on a Commonwealth Professional Fellowship. "This lake is so important for the region's sustainability and, for years, construction was allowed to continue despite the fact that it was illegal." In mid-July, the high court ordered the formation of two committees: one to mark and demolish the illegal constructions, and another to determine which officials were liable for allowing the construction to happen in the first place. Singh, who grew up in Nainital, says he'd like to see the dry lake bed returned to what it was when he was a child. "It should be cleaned up and preserved so children can play there in the dry season," he says. 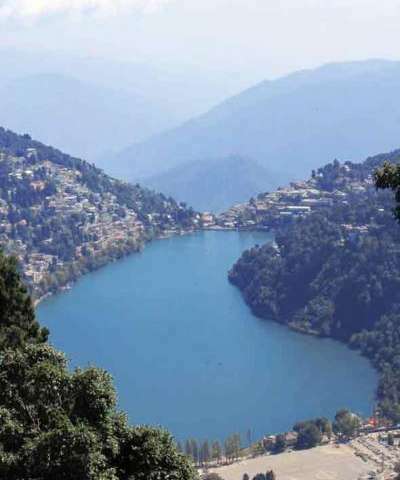 "This lake is so important to Nainital's identity – let's preserve it."